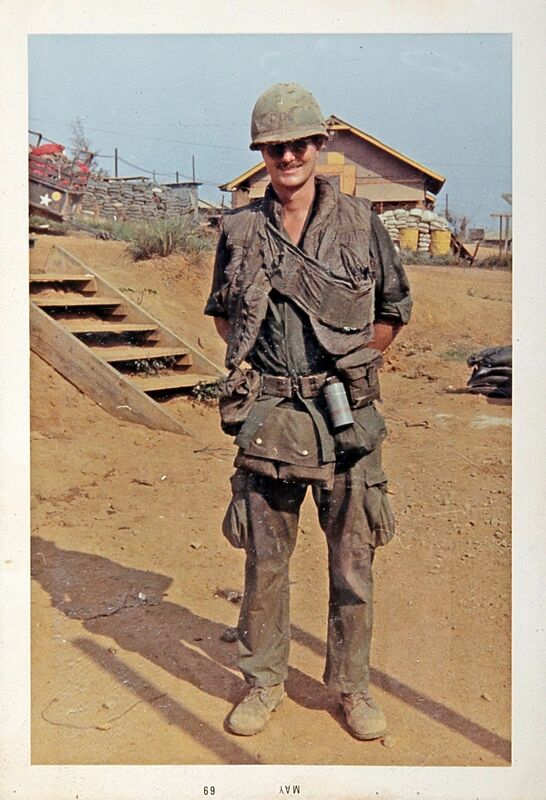 Veteran Clint Whitmer is pictured in his gear in Vietnam. Veteran Clint Whitmer poses for a picture in his Army uniform. Vietnam veteran Clint Whitmer was drafted into the Army in 1968. Vietnam veteran Clint Whitmer poses for a picture in full gear. Clint Whitmer served in the U.S. Army from 1968 to 1969. He was born in Glendive and now teaches high school in Frazer. He was drafted after college. Gazette: That’s a pretty hard reality. He went to medic’s training at Fort Sam Houston. Then he flew into Pleiku. Whitmer: “The back door (of the plane) was opening, and it was just so green that I had never seen anything like that. The pilot had said, ‘If the red light comes on, put your head between your knees.’ We took off again and landed at An Khe and ... it was home to 173rd Airborne. Whitmer was assigned to the Americal division. Chu Lai had both Viet Cong and North Vietnamese Army soldiers active near it. Gazette: If there’s some apathy among soldiers, why is that? Whitmer: “The thing about it is: When we’re in Fort Sam Houston, they said, ‘You have to go over there and kill all those mother-rapers and baby rapers.’ You get over there and find out that Ho Chi Minh is father of his country, that he went to college in Paris. You realized that Vietnam had never had home rule. It had always been ruled by China or Cambodia or a neighboring country. ... So you find these things out and that Ho Chi Minh is Vietnam for the Vietnamese. ... The American political thought is that communists are bad, communists are whatever. Gazette: Are you thinking about the politics of the war as a soldier? Gazette: What’s an average day like? About 50 miles south of the border? Whitmer: “We were against the coast. Highway 1 was between the ocean, the South China Sea, and the mountains in the background. ... We had rice paddies. Then, against the mountains, we had dense jungle. On the coast you had sandy beaches and I remember thinking, ‘Man, I could just see a 20-story hotel here.’ The beaches were so nice. I body surfed in the South China Sea, and it was just wonderful. “We usually went 10 clicks at night. We would have radio watch. We’d have two or three places we’d have to set up during the night. In the morning, we’d have to walk 10 kilometers again to walk to a different area to receive instructions for a different place. Then, every once in a while, they’d send you for a stand-down and you’d get a steak. “As a medic, you have to upgrade the shot cards. I would have to give shots. We’d always have two or three guys who would say, ‘You ain’t giving me those shots.’ ‘Well, you get a steak.’ ‘I don’t care.’ They would sit outside and drink water. They would not go and get their shot card updated and get a steak. “... I had the power of life and death over those GIs, because if they came to me and they were complaining about something, I said, ‘No, you have to stay in the field.’ That means they had to stay in the field and get shot at. I never abused that. I was always fair and honest and always: If that’s what it is, that’s what it is. It came down to being a responsibility that you had to acknowledge and you had to do the best you could with it. Pretty soon we land, and it’s like 20 miles south of any place we’ve ever been before. And we look around. Oh man, because it’s scrub jungle — small trees, pines and bamboo. That first day we’re walking towards a stream, and we look and we can see a path in the bottom of the stream. Is it going our way? Yeah. Well then let’s take it. We just dive into the stream, and it’s floating our backpacks so that’s kind of cool. We’re walking down the stream. “I was in CP, the unit command post, so I was always in the center of the platoon. When we moved out, we had the point man who was always a rifleman, and then we had another rifleman and then we had the M60 machine gun. Then, we had an M16 machine gunner. Then, we had an M79 man, which was a small-projectile rifle. Then we had the platoon leader and then (radio transmission), then the medic and then we had the same to the end. “I’m in the middle of it, and I hear this rustling in the bamboo and I looked up and it comes down and splash! What the heck? The next thing I know everyone behind me is out of the water. The next thing I know, I turn around, there’s this python snake crawling over this black soldier’s leg, and he’s the M60 machine gunner. He dives back into the stream with his rifle. He comes up coughing, pouring water out of his M60 machine gun. The snake is going off into the jungle. Those guys behind us would not get back into the water.They hacked their way down where we had to go.